We meditate to beautify our outer self, purify and balance our inner self and know Self. As Yoga is a method of communion of joining two things together, meditation is the technique and science to behold the consciousness, tranquilize the entire personality and develop the awareness with absolute consciousness. The aim of Meditation is to explore the different regions of the mind and eventually transcend the mind completely. Meditation can be experienced through various techniques which are simplified in Satyananda/Bihar Yoga and as we go deep, we experience and become aware of all multi dimensions of our own personality. It is one of the most important annual events of India going back centuries – a wonderful festival of art, learning & education that can awaken the higher consciousness and creativity within us. Maa Saraswati is the goddess of Art, Knowledge, Music, Wisdom and Learning. The Goddess is often depicted as a beautiful woman dressed in pure white, often seated on a white lotus, which symbolizes light, knowledge and truth. She not only embodies knowledge but also the experience of the highest reality. Her iconography is typically in white themes from dress to flowers to swan- the colour of Sattwa Guna or purity, discrimination for true knowledge, insight & wisdom. ☆ The book she holds symbolizes the VEDAS representing the Universal Divine, Eternal and True Knowledge as well as all forms of learning. ☆A Mala of Crystal represents the Power of Meditation, Inner reflection and Spirituality. ☆ A pot of water represents the purifying power to separate right from wrong, the clean from unclean, and the essence from the inessential. Also the pot of water symbolizes Soma, Amrut, Nectar- the drink that liberates and leads to knowledge. 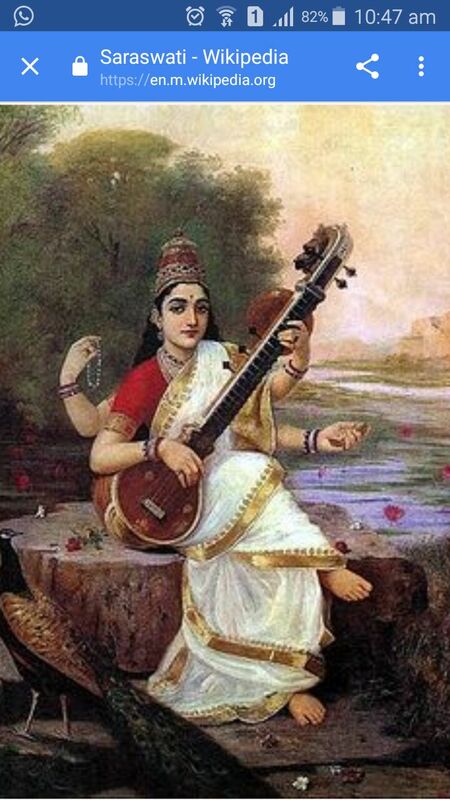 ☆ The most famous feature of Maa is a musical instrument called Veena which represents all creative arts, and Sciences, and her holding it symbolizes expressing knowledge that creates harmony. ☆ Maa Saraswati is also associated with true expression of feelings and emotions in Speech or Music. ☆ Saraswati is also referred to as HAMSAVAHINI whoch means “She who has a Swan as her vehicle”. The Swan is also a symbol for spiritual perfection, transendence and Moksha. A Peacock is shown besides her which symbolizes colourful splendor, celebration of dance and – as the devourer of snakes – the alchemical ability to transmute the serpent poison of self into the radiant plumage of enlightenment. She is usually depicted near a flowing river, which is a reference to her as a river goddess – The Saraswati River. Today is Basant Panchami too, which falls on the fifth day of Spring. This is the celebration of Harvest, Kites and the yellow Mustard Fields. People wear shades of yellow today and prepare sweet yellow rice as prasad. Happy Saraswati Pooja & Basant Panchami to all of you. • Yoga Nidra is one of the easiest practice done in Savasana (lying posture), which can be widely applied in the modern world to improve the quality and happiness of human life. • Yoga Nidra is the best and most permanent method of inducing deep relaxation of the entire human structure and personality. • It is a meditative technique which acts directly in eradicating deep rooted psychological complexes, neurosis, inhibitions, etc. It is an advanced psychiatric tool. • Yoga Nidra induces and improves pattern of sleep. It is a non-chemical tranquilizer that quickly removes insomnia. • Yoga Nidra opens up the potential of the mind and also awakens the faculty of intuition. • Physio-psychological rejuvenation of the entire human organism can be brought about by Yoga Nidra.